Successful trainer, competitor and instructor Barb Davis, from West Palm Beach, Fla., shows Shelties and border collies and will be featured in an upcoming series of conditioning articles on the USDAA website. As a longtime Cynosport® competitor, Barb will be returning to the event with her 8-year-old smooth coated border collie, Flex. Barb and Flex were finalists at the 2018 event, and we asked her to share how she keeps him running in tip-top shape year after year. Barb’s road to Cynosport® hasn’t always been an easy one. “Flex had an accident in a very stiff tunnel five years ago. After successful surgery and treatments at Colorado State University, he needed to be conditioned from the ground up to get prepared to return to agility. We set up a special rehab program and still use many of the exercises today,” she said. Not all dogs take to water right away, and many different strategies can be used to introduce dogs to swimming. 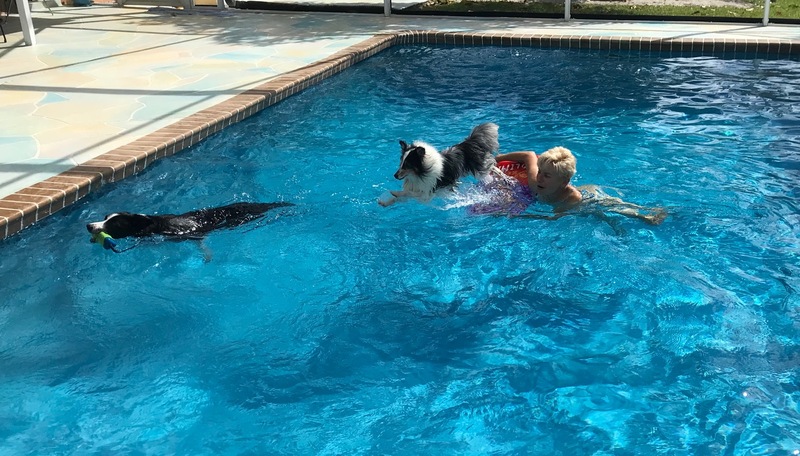 Barb’s Shelties participate in Flex’s conditioning routine and have learned to enjoy the pool by riding on a small boogie board while she guides them into the water. As an added benefit, “the boogie board conditions the core much like a peanut ball.” Once her dogs are in place the fun begins, and Flex and the Shelties are released to race back to the pool steps. Flex also enjoys conditioning games on land. Barb has found that while chasing balls or other thrown toys can be hard on his body, training offers a solution here, too. By using her distance handling skills to send Flex away from her, and then calling him back into a toy held at head-level, Flex can enjoy a game of “fetch” that does double duty towards preparing him for the sport that he loves to play. Look for more tips and training techniques next week on USDAA.com.